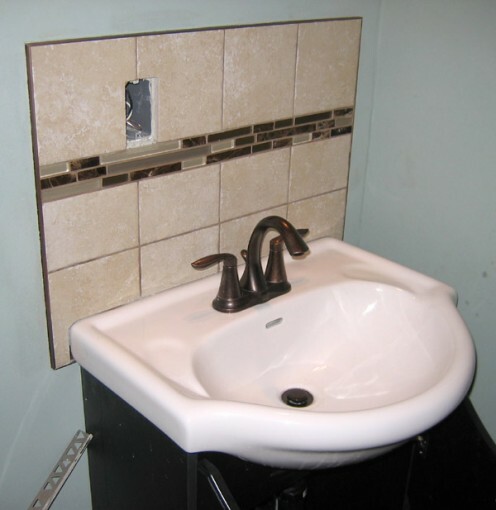 When this vanity was installed, it didn’t tie in with the rest of the bathroom until the tile backsplash was in place. The backsplash served two purposes. The first purpose was to protect the clay plaster wall behind the sink from splashing during regular use. The clay plaster will absorb water and then dry out without leaving a mark, but soap scum and toothpaste lightly stain the wall. The change we would suggest in the future would be to use tile as wainscotting on the whole wall and anywhere that water may be splashed. The second purpose was to make the vanity an integral part of the bathroom design, and this was accomplished by using the porcelain and mosaic glass tiles that match those in the bathtub surround.